WASHINGTON—Lamenting that even the purest hearts were fated to be broken, the confused and anguished U.S. populace was struggling Friday with the question of why bad things happen to good people following the news that Vanessa Trump filed for divorce from Donald Trump Jr. earlier this week. “How could this happen to our Don, sweet Don Jr., of all people? He’s kind, thoughtful, warm, caring, and compassionate—He doesn’t deserve this,” said the visibly distressed nation, wiping away hot tears brought on by contemplating the fundamental injustice of a world in which ill fortune befalls those who love so completely and selflessly. “This is such a blow to that whole generous, caring family, those angels dwelling among us, those who gave themselves to us all and asked for nothing in return. The searing pain of heartbreak must be a thousand times worse for hearts as pure as Don’s and Vanessa’s. 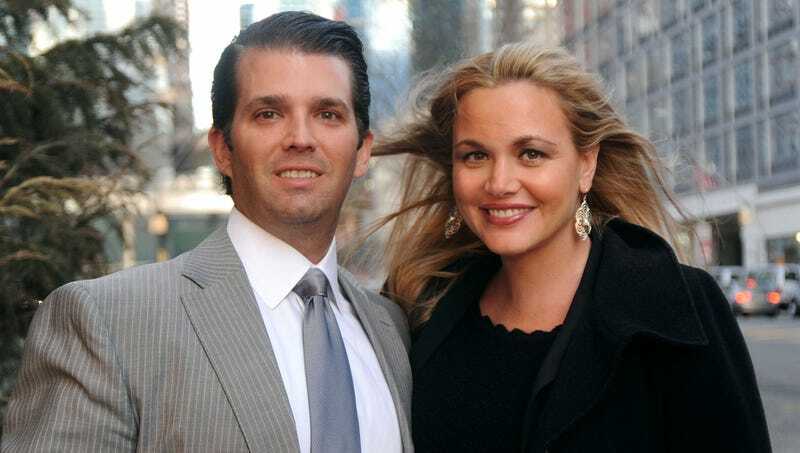 If only we could take their agonies upon ourselves and spare the Trumps this soul-deep anguish!” As of press time, the saddened American populace had let the couple know they were there for them if needed, just as Don Jr. and Vanessa had always been for them.